The German is available to sign on a free transfer at the end of the season. JUVENTUS WILL TRY to tempt Emre Can and Leon Goretzka to join them next summer, chief executive Giuseppe Marotta has revealed. With their contracts in the final year, Germany internationals Can and Goretzka can leave Liverpool and Schalke respectively on free transfers at the end of the season. Consistently linked with both players in recent months, Marotta confirmed the Bianconeri are keen to bring them both to Serie A as they look to add further depth to an already star-studded squad. “They are available for free at the end of the season,” Marotta told Calciomercato.com. Having progressed through Bayern Munich’s youth system, Can spent just one year with Bayer Leverkusen before joining Liverpool in July 2014. The 23-year-old is a regular in Jurgen Klopp’s first team this season but has so far failed to agree terms on a new contract with the Premier League club. Goretzka, meanwhile, does not turn 23 until February next year. Signed from Bochum four years ago, he has become a mainstay for Schalke, who still hope they can persuade the player to stay. “In the winter we will definitely not let Leon go. We all hope he extends,” Christian Heidel, the Bundesliga club’s business manager, told Bild. Goretzka suffered a stress fracture in his lower leg in October but could make an earlier-than-expected return to action on Sunday. “There is a slight improvement. There is hope that he is against Hamburg. But we do not take unnecessary risk,” Schalke coach Domenico Tedesco told Bild. Email “Juventus confirm they will pursue Emre Can as Liverpool contract talks continue to stall ”. 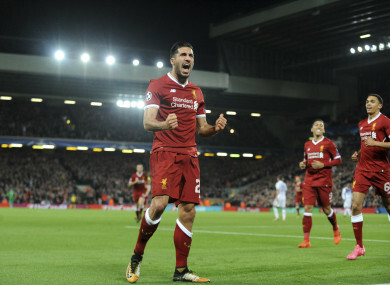 Feedback on “Juventus confirm they will pursue Emre Can as Liverpool contract talks continue to stall ”.